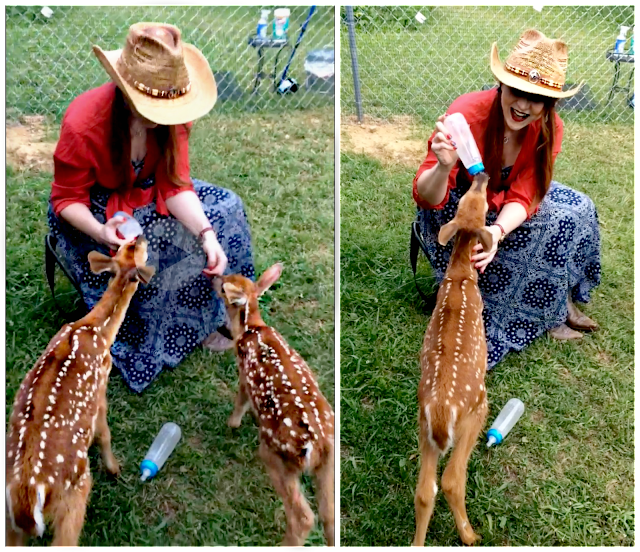 One of the highlights of my Fourth of July weekend was helping a friend feed these darling little bucks. The four little white-tailed bucks being rehabilitated by a friend of mine are so cute I can hardly stand it. Photographs do not do justice to how truly sweet they are. Last week, I was fortunate to have the opportunity to help feed them on two separate occasions. I'm pretty sure I had a permanent smile on my face the entire time. 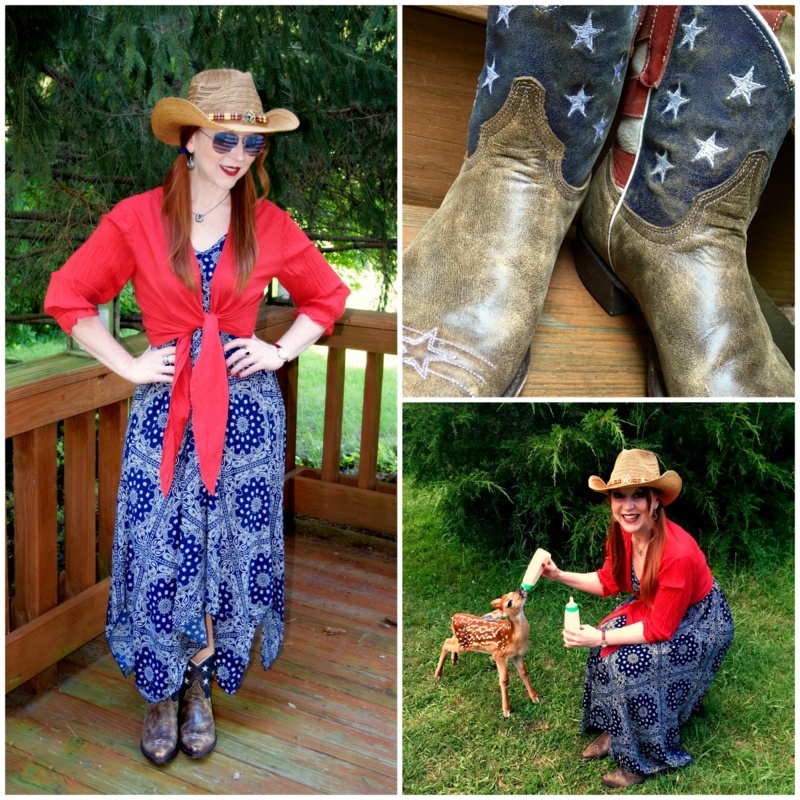 The clothes are superfluous compared to the undeniable sweetness of the baby deer, but since Red's Shoe Diaries is, at its core, a style blog... Navy maxi dress (Amazon); Red maxi dress (Meijer); American Flag aviators (Steinmart); flag earrings (Gordmans); the hat was a $10 find at some little vintage store on Melrose Avenue in Los Angeles whose name I'm not sure I ever registered. Getting up close and personal with Carmine, Lazarus, Sampson, and Elvis was an experience I'll never forget, but I wish it was an opportunity I didn't have. Deer are wild animals. They are not pets (however sweet and cuddly they may be). These little guys are being bottle fed on my friend's farm out of necessity because they were separated from their mothers too soon. The babies all have unique personalities, as well as markings, which make them easy to distinguish from one another. 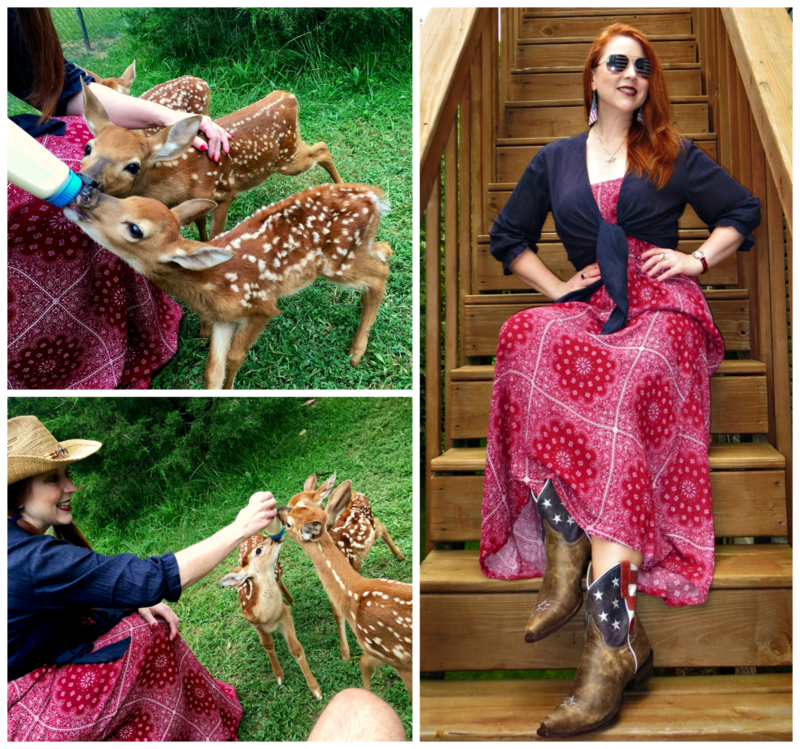 It takes a special kind of person to rehab deer and other injured or abandoned wildlife. 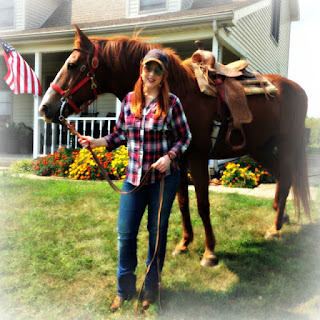 A big heart and a willingness to get dirty are key; but it also requires a permit or license from the Indiana Department of Natural Resources. In other words, don't try this at home. Sadly, well meaning citizens are a primary reason that young wild animals require rehabilitation, as people often remove the babies from their natural habitat under the mistaken belief they've been abandoned by their mothers or are otherwise in distress. Fortunately, rehabbers like my friend are there to help, caring for the juveniles until they are strong enough to fend for themselves. 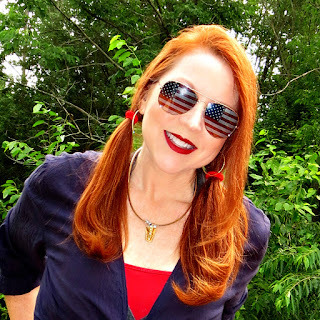 I wore these American flag boots by Roper a few times last week in honor of the Fourth of July holiday. You can find them on sale here. If you come across a wild animal that you believe is in need of human intervention to survive, you can find information and resources on wildlife rehabilitation and licensed rehabilitators on the DNR's website. As tempting as it may be, it's a mistake to try to care for the animals on your own; it takes expertise to feed these babies the right foods (NO cow's milk) in the right amounts and to ensure they retain their wild instincts and don't remain dependent on humans as they mature. You can always ask the rehabber if you can help out, though. It's an experience you won't forget! 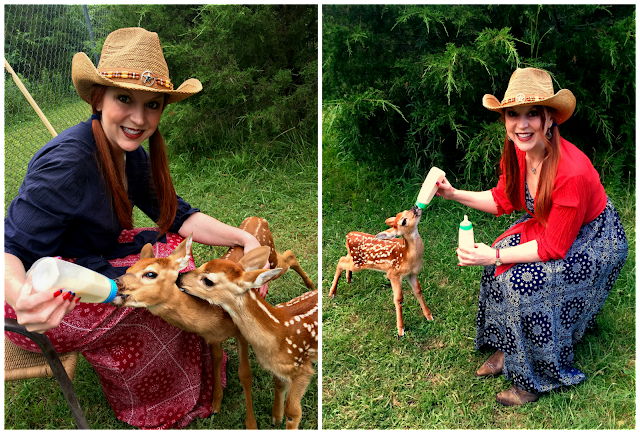 These babies are being nourished by goat's milk, and they're also learning to forage for fruit. 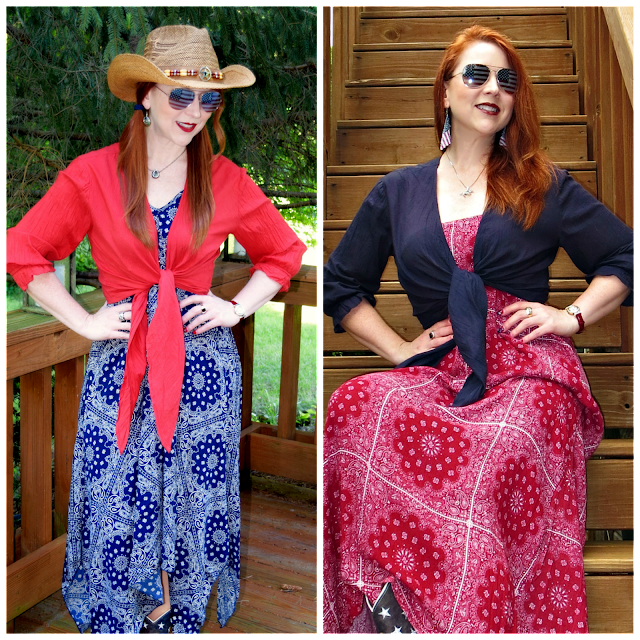 I'm also linked up with Style Crone's Hat Attack today! Thank you so much for sharing with July's Hat Attack! I have been slow with commenting due to travel! Hope that you will link up with your gorgeous headwear on August's Hat Party. Participation is open all day, every day! Baby, You're the Bomb (pop)!